Thanks to the lovely arctic conditions we have been having here in Hertfordshire recently, our school has been frozen solid in the mornings and still too hard in the afternoon for me to feel happy doing much in there. Because of this, Scottie has done very little (practically nothing) this week. 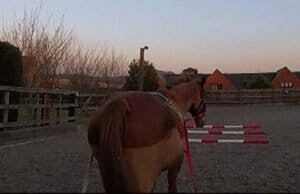 So yesterday I decided to long rein over some poles in walk to give him something to think about. I jumped straight in with this idea, laying 3 poles down the quarter line and then 2 poles on an angle. I got this idea from a post I read this week on the Rubber Curry Comb about using angled fences in a double to check your straightness. So I hoped that trying to keep Scottie straight over these angled poles would be a good exercise for us. Scottie was very good about being long reined, despite not having been asked to do it for about 2 years. He was a little hesitant when we first started off, expecting to be asked to go in a circle to lunge, but he quickly realised what we were doing and got on with it. We did a few laps of walk before heading into the 3 poles. My aim wasn’t the best, but Scottie also did his usual “it’s a pole, it’s a monster” and wasn’t brave enough (and was being a little naughty) and walked round it. But we came straight back round to it and walked over the first 2 (driver error) before getting all three on our 3rd attempt. After this we kept going over them on both reins. I was trying to get him to keep straight over the middle of the three poles, or at the very least straight from where we went over the first pole.Generally we did well at this. As long as I got us a reasonable line towards the poles, Scottie didn’t need too much adjusting between the poles. But he definitely has a tendency to drift left, which is much easier to see while long reining than when riding. Next we attempted the angled poles. Again my first line was terrible and Scottie used this as the perfect excuse to duck away to the left. But second time round we did it quite nicely, not being too wonky between the poles. By the end of the session we were staying on a straight line over the two angled poles, not trying to adjust our direction between them. We did have a bit of a silly moment heading into the three poles at one point where Scottie decided he wanted to trot them a few strides away. Fine, I went with him but after the poles he got a bit excited and trotted a couple of circles around me to get out whatever it was he needed to get out. After this we went back to work doing the poles and did some more nice work before going on to work on our transitions. We walked around the school halting at regular intervals and getting Scottie to stand until I asked him to move forwards. I think long reining worries him a little bit as he really wasn’t happy standing still and kept fidgeting. But the more transitions we did, the more he relaxed and waited for me. Although he did keep turning his head round to look at me as if to say “are we going now?” He does the same thing when he stop to wait for someone to catch up out hacking. Once we were a bit more relaxed in the halt, I started asking for him to back up, which he did really well. He was a bit tense, but very obedient. Our back up wasn’t too ‘correct’, our left fore and right hind moved back together nicely, but our other diagonal moved at slightly different times. But I think this might be down to tension and hesitation. By the end of the session we were backing up a good 10 steps at a time. Albeit they were small steps, but Scottie is showing that he understands the aids, even if he isn’t performing the action perfectly. So although I’m not sure I could call it exercise for Scottie (it certainly was for me!) It was a really product session for us. It gave me a new view of what Scottie is doing over poles and allowed me to see what hes doing when we rein back. Which will hopefully really help us when riding. I will definitely try and do more long reining this year to see what we are doing. I managed to film the first half of our session before my GoPro ran out of battery. So you can watch most of our session below! The Warm Up Ring for Dummies!